Berkshire’s 23RXT Arch might be part of its midlevel STS Series, but that’s misleading, because this pontoon is all about sporty luxury. 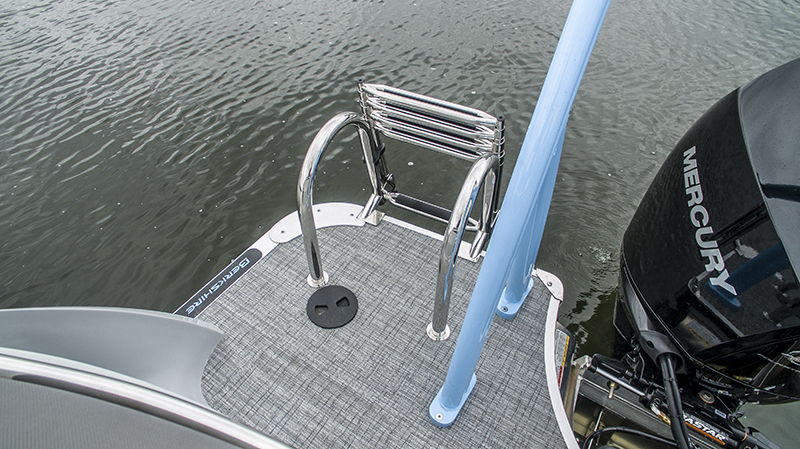 Berkshire offers a lot of options, but buyers don’t have to agonize over each one; they can check the Super Sport box and receive an upscale pontoon that will attract a lot of attention. Our test boat was Super Sport–equipped and featured the Lagoon Blue color scheme, which really highlights the color-coordination aspect of the SS package. Most eye-grabbing is a blue aft-curving ski tow and a matching forward-swept arch that’s two feet longer this year, which allows the Bimini top to be stretched to an oversized 10 feet. 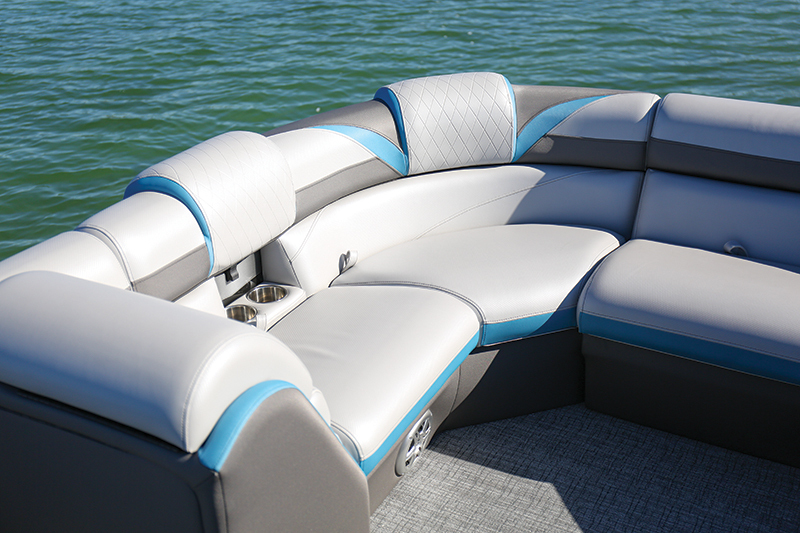 Blue fence panels and matching trim on the Silver or Pearl White upholstery will have owners adjusting their wardrobe to be in sync with their pontoon. 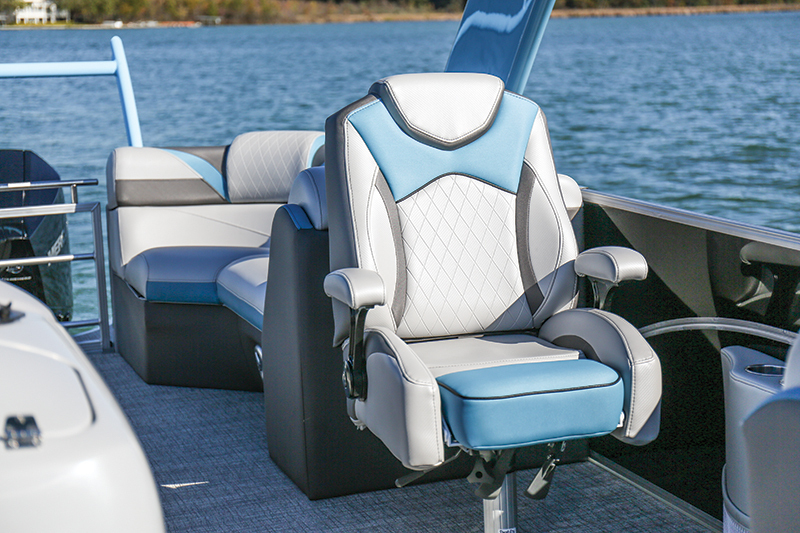 The SS Silver package ($7,699) includes a pair of high-backed captain’s chairs with wide flip-up bolsters and aircraft-aluminum armrests. Another SS perk is the Silver Matrix flooring, which is an upgrade over the standard vinyl deck (Berkshire eschews carpeting). While the standard stereo is an impressive Kicker KMC10 system, the premium stereo is a JL Audio upgrade with 800 watts of power, a JL subwoofer, speakers in the cockpit and coffee can tower speakers. The nighttime ambiance is attractive and functional thanks to recessed, lighted cupholder modules in the layback bow lounges whose USB chargers are also lighted. A wood-grain pedestal table is available to hold beverages and food. 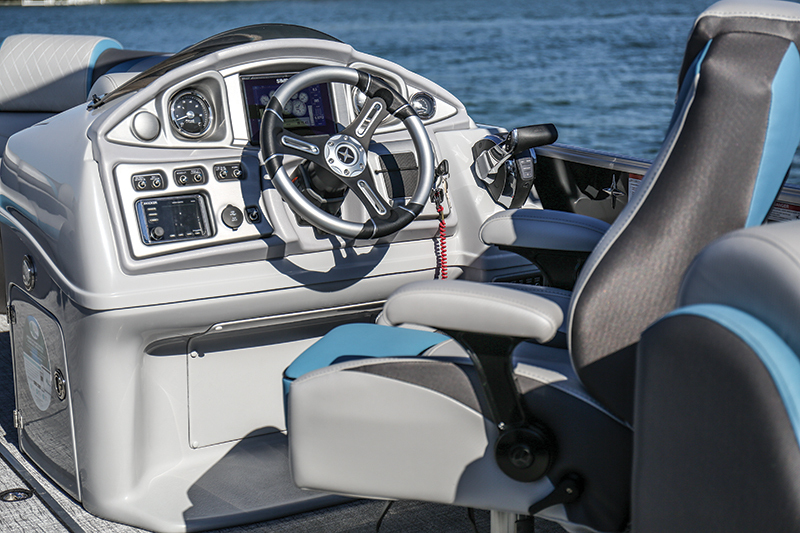 At the Silver Helm station, which is part of the SS Package, the standard Simrad G07 chartplotter has advanced features such as CHIRP sonar and StructureScan, which delivers a near-photographic view of the bottom. It also supports the ForwardScan sonar upgrade, which shows what’s in front of the pontoon — important when navigating shallow water. Our test boat’s retail price was $77,981. That prices includes the tripletube 3.0 Performance Package and Mercury’s new-gen 250 hp V-8 FourStroke (linked to the Simrad display). 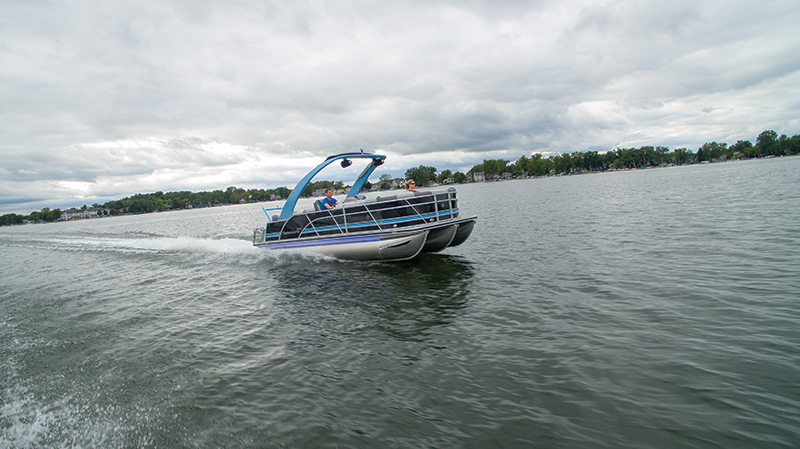 The boat featured Smart Tow, which is great for pulling skiers at a precise speed, and ActiveTrim, which keeps the boat properly trimmed without driver input. ActiveTrim helped give the 23RTX Arch STS a tremendous hole shot that put it on plane in 2 seconds. It reached 30 mph in just 4.6 seconds and hit a top speed of 48.2 mph. Time to 30 mph: 4.6 sec.